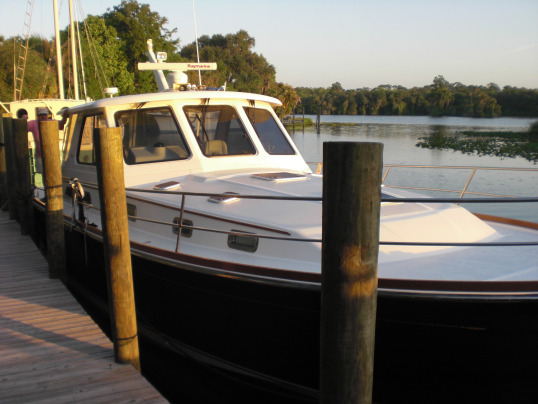 We're planning a trip next month from Jupiter, Florida to Sanibel Island, Fl via the Okeechobee waterway. I was wondering if any of you fellow trawlers have any suggestions. Good marinas along the way and information on controlling depths etc. Rialto Harbor at Alva is one of our favorites. Not much near there, but very relaxing. There was a good pizza place in an old gas station up on the highway. That sounds good. Do you have the coordinates? Capt. Mike: Looks as if I'll probably be doing the same trip around the same time. 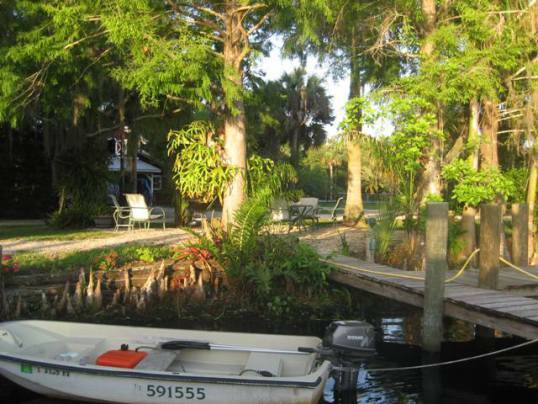 I'm camped out right on the Waterway in Stuart, so all I have to do is take my first left. Be aware that when I left my boat last week, the tides were running about a foot higher than usual at the marina, and not really going down too much. The Army Corps. had the gates open at the lake, and the St. Lucie river was moving at 3-4 knots. A broker was trying to get into the marina with an Independence Cherubini trawler and had to charge full speed toward the sea wall just to get a bow line to me. There's a lot of rain going on still, and my guess is that the flood gates will stay open for a while. That means you're going to be going uphill till you get to the Lake. I'll be taking my Manatee up to our Longboat Key residence. Listen to the Moonman! He knows all the good eats on the east coast. You have an amazing memory for restaurants, Don!! One more thing I love about you! Awe shucks, it's nothing, but thanks. The couple travelling with us had lived in Naples Italy for three years. They said it was the best pizza since leaving there. Go figure. A converted gas station on a highway in the middle of nowhere had the best pizza! That's what I like about travelling. I thought I had heard the Realto marina had closed. The owner was going cruising. Can anyone verify this? Below is from Active Captain...pretty handy and quick reference...can't guarantee it's accuracy...but it's always been "right on" for me. Additional info: The owners of Rialto Harbor Docks have decided to retire and will be closing the marina the end of April 2013. We wish them many happy and healthy years of retirement." We made the trip in 2010 if you check the blog below 2010, March 25- 28 you can see the details of our trip. We also did it in 2009 before my Bloggin' days I'll see if I can find the info and post it tonight I do recall we had a nice overnight at FF's dock,thanks! I'll be heading through with my crew the week of 9/23. More of a delivery trip though so I am going to shoot through as fast as I can. In the past I have stayed at Roland Martin's in Clewiston, it is OK, but a little pricey for what they offer. I've also stayed at the Moore Haven City dock, nice dock and cheap, but not a lot there. More of a place to lay your head than anything else. The Fort Myers yacht Basin is also a nice stop. Lots to do via foot in FM. Indiantown Marina is really nice, but likely not far enough along to stop at for you. Water levels are super high right now, you should have at least 9' all the way through. Too bad for the cruisers. The place was unique. Each dock was a private "T" dock with comfortable chairs under the shade. If you wanted to grill they would start a real oak fire to get coals ready. They brought a newpaper and vase of fresh flowers in the mornings. The grounds were beautiful with palms and live oaks. The pool is nestled in a private corner of the property. Most of their clients were repeats or permanent. They kept a record of your stays. The owner, Bus, had bought a farm in the Tennessee Mountains that he was preparing for retirement. They also owned a large steel explorer type sail boat for extended voyages. Thanks for the info. Hopefully The Army Corps. gets wise and stops flooding the estuaries with fresh water. They have already caused enough damage. We'll probably be departing September 9th or 10th. Keep in touch. Our vessel is The Path. Thanks. We should be departing September 9th or 10th. Here is why I will miss Rialto Harbor. This was shot from the boat docked there. A nice place to hang out for a couple of days. Morning at Rialto Harbor. Moonstruck preparing to pull out heading East.Bus' sail boat is driectly behind, but you can't tell much about it. Dang. That sure looks like a great place to stop. I guess I'll miss it. Army Corps announced today that they will begin to squeeze off the lake flow a bit, saying that the Lake levels are coming down now. Of course, in Florida, that could all change next week. Jan 14 Dept Roland Martin's 10:20 AM Passed Moore Haven lock, arrived FF dock on Turkey Creek 2:30 PM. Ft Myers is a very nice place for a stay walk to Edison, Ford houses/museum, Publix and lots of good restaurants. The City Marina and Legendary Marina are both good but we have a slight prefference for legendary. City marina has great fuel price, last fill up. It looks like we'll be crossing lake Okeechobee towards the middle or end if September. We're heading to the Everglades to do some fishing them we'll probably run back thru the Keys.